As artificial intelligence becomes more popular, skills like machine learning and deep learning are becoming more in demand. New data released from LinkedIn shows job recruiters are fighting to find machine learning talent. “Machine learning is one of the most in-demand skills. It can feel like everyone’s competing for the same small talent pool, especially when you’re looking within your own industry,” the company wrote in a post. To help weed out some of the competition, LinkedIn is providing three actionable insights and strategies for recruiting talent. Upskill talent: According to LinkedIn, if you can’t find the exact skills you are looking for, it might be time to switch gears and find candidates who are willing to learn the skils necessary. “Instead of competing for people with machine learning skills, it might be worth hiring candidates or finding existing employees who are well-positioned to develop machine learning skills,” the company wrote. Candidates with experience in HTML, Java, C++, SQL, statistics, data analysis, data mining and Python may be the most suited for learning new machine learning skills, according to the company. Outsource machine learning talent from other industries: According to LinkedIn, candidates with machine learning skills show a willingness to try out new career opportunities, The data shows 22 percent of people changed jobs last year and 72 percent who changed jobs also changed industries. “If you’ve been tasked with bringing machine learning skills to your organization, chances are good that you’ve already scoped out your immediate competitors. Looking beyond your own industry can help you expand your talent pool and increase your odds of landing someone with those sought-after skills,” the company wrote. 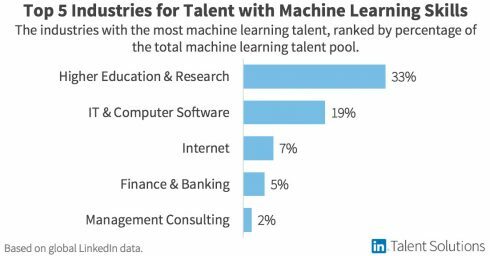 The top 5 industries with machine learning talent are higher education and research, IT and computer software, Internet, finance and banking, and management consulting. Target machine learning talent with other skills: “Of course, machine learning isn’t the only skill these professionals have. By looking at the other skills held by machine learning talent pivoting into your industry, you can find those who may be more likely to join your company,” according to the company. Some of these skills include distributed systems, Git, PHP, CSS, business analysis, SaS, business strategy and business analysis.